The Ion exchange process involves the exchanging of contaminant ions for Na+ ions in a softening application and H+ and OH- ions in pure water application. 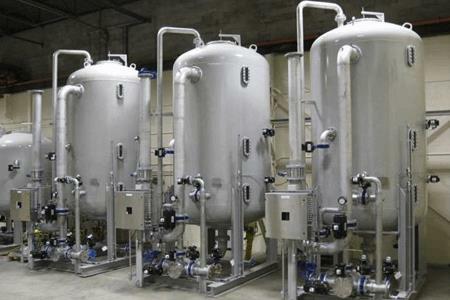 Ion Exchange technology is a proven method of producing high purity softened and demineralized water, first commercialized in the 1940’s and 1950’s, and is used in most industries which require high purity water. Regeneration techniques would include co-current, split-flow counter current and packed bed designs. The highest purity water is produced with mixed bed systems which incorporate cation and anion resin in the same process unit.